Scarborough, ME – The highly anticipated Pro All Star Series 400 weekend at the Beech Ridge Motor Speedway was here once again, and the Amsoil NELCAR Legends Tour rolled into the pits to race in familiar territory. A season high 23 cars were on hand, sailing by the previous high of 20 cars at the season opening event at Lee USA Speedway. With just 25 laps the distance, could the usual suspects pass more cars than usual to take the top spots? Or will we see a first time winner? Darren Johnson in the 2 and Matt Chagnot in the 8 started on the front row for the first heat race. Johnson set sail and put his dark blue coupe on the point in the early going, until the 29 of Trevor Sanborn, who has turned many laps at Beech Ridge over the years, eventually took over the top spot after starting last, and went on to claim the checkers over Johnson and the 33 of Alan Smith. Richard Humphrey in the 27 and Anthony Pagliarulo in the 60 led the field to the green in heat 2. Mathew Bourgoine made his way from the 9th starting position to the front of the pack when the checkers flew, holding off several fierce competitors en route to another heat win. Andy Santerre in the 44 and Bobby Timmons in the 78 rounded out the top three. Trevor Sanborn and Darren Johnson started out front for the feature, which shaped out to be a good one. Sanborn set sail early on in the Jay Cushman owned coupe, with the rest of the field side-by-side behind him. The first yellow flag flew within the first 10 laps, as the 27 of Richard Humphrey went for a spin off turn 2, collecting the 5 of Todd Harrison and the 00 of Phillip “Buckshot” Brackett. Harrison received heavy damage, ending his day early in what has been a very frustrating rookie season for the Durham driver. Sanborn resumed the lead at the restart, but several of the other contenders had begun to creep into the top 5. The caution flew again just a handful of laps later, when contact between Darren Johnson and Matt Grant in the 84 sent Johnson for a spin, collecting Matt Chagnot in the process. Bobby Timmons missed the wreck, but the 5x of Gary Modugno, who owns Timmons’ car, clipped the 78 on the way by, and received terminal damage on his coupe. Chagnot was forced to retire from the event as well. For the final dozen laps after the restart, the fans were treated to a ferocious four man battle for the lead! Sanborn and the 399 of Bob Weymouth held on to the bottom, while Andy Santerre and Mathew Bourgoine tried everything they could to make the top line roll. At the finish, Trevor Sanborn held off all challengers to take the 29 car home a winner! Bob Weymouth ran a strong race and took the runner up honors in the Moat Mountain 399, Andy Santerre brought his 44 machine to the checkers in the final trophy position, Mathew Bourgoine attempted every move possible to get around the top 3, but had to settle for 4th, and Matt Grant rolled to a solid 5th place finish in the Tim Grant Plumbing Plus/Gore Moving and Storage sponsored 84. 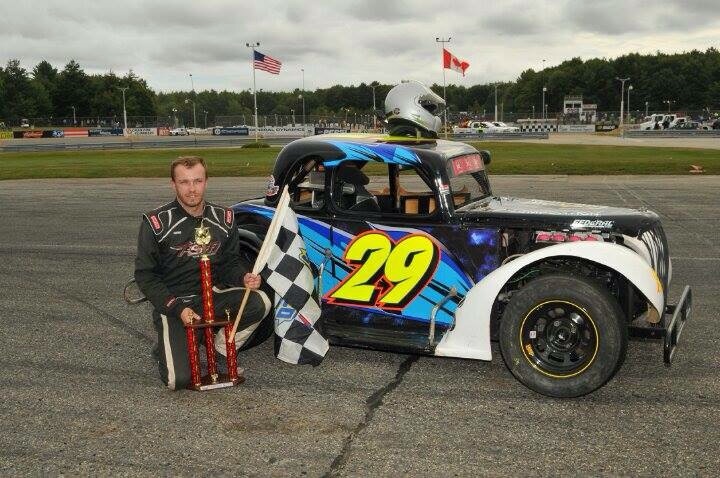 Next up for the tour will be the final visit of the year to Wiscasset Speedway this Saturday, where Mathew Bourgoine will be looking to sweep all five race wins at the fast coastal track, as well as lock up the 2014 NELCAR Championship. For more information about legends cars, visit www.NELCAR.net, Like NELCAR on Facebook, and follow us on Twitter @NelcarLegends.